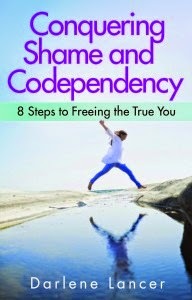 Conquering Shame and Codependency: 8 Steps to Freeing the True You was an interesting title that grabbed my attention. While I don't find that I have many issues, personally, with shame or codependency, I do feel that when books like this one cross my path I should read it to assist me on my own journey of helping others through their lives. That probably sounds a little bit jumbled. Basically, as a social worker I look to others to share their research, experience and understanding of things that impact people I might have as future clients. And so, I volunteered to read Ms. Lancer's book. Ms. Lancer is a Licensed Marriage and Family Therapist, and no doubt has seen many an individual impacted by both, shame and codependency, and seen their relationships affected by both, as well. I looked forward to hearing her take on all of this. One of my favorite parts of this book was the comparison between healthy relationships and codependent ones. This information is displayed in a table that is titled, Progression of Love. And how true that is. You can watch the issues start from the get-go in a codependent relationship. It's so easy to say things have changed and made things "this way," but often reflection will show that there was some anxiety or detail there that was overlooked until it escalated. I think one of the most important things to remember is that while we frequently determine just how we value ourselves based on our relationships and whether or not they succeed, it's critical that we take care of and remember to value ourselves first. The indicated eight steps inside this book are a great way to get moving on the path to recognizing who we are and how to stay true to that. 3. Find your shame's roots. I probably could have simply posted these eight steps and encouraged you to pick up the book, but I hope that my insight and intro was enough. This book is a self-help book, a resource for clinicians and a good reminder to take care of ourselves. This review is a bit choppy, I'm aware. I had to make some edits because my words just sort of jumbled in regards to mental health in recent news. So, I remind you, on today, of all days, it's important to remember that we matter. And we deserve love. To be loved. To love ourselves. So take the time to do that. Unleash the shame and move forward. I didn't think your review was choppy at all. I don't think my current relationship is based on co-dependency, but a past one was. The signs were all there in the beginning! I might like this book for the 8 steps though. I still struggle with shame and confidence. This looks good. I don't struggle with codependency, but dumping shame and building self-esteem are things I need to revisit. Probably more often than I would like to admit. I needed to read this. I needed to read this so very much. Wonderful review Andrea. I love the 8 steps! Such a great review. I normal don't read self-help books but you've convinced me. Thank you for sharing. Sounds like a great resource for those that struggle with shame and co-dependency. Though not my challenge, I will keep the title to recommend to friends that may benefit. I think book reviews are very challenging to write. You did a great job.